FILE - In this photo released by the U.S. Army, U.S. soldiers gather for a briefing during a combined joint patrol rehearsal in Manbij, Syria, Nov. 7, 2018. Talks between Syrian Kurdish forces and Damascus are seen as the latest repercussion from Washington’s decision to pull troops out of Syria. The talks could force Ankara to end its freeze in diplomatic relations with Damascus. Both developments are key objectives of Russian President Vladimir Putin. Moscow has been lobbying the PYD and its military wing, the YPG, to sit down with Damascus in a bid to pry away the Kurdish groups from Washington's influence. Earlier this month, White House national security adviser John Bolton appealed to the YPG to refrain from dialogue with Damascus. "I think they know who their friends are," Bolton said, referring to the Kurds. The YPG's allies in the U.S.-led war against Islamic State had largely resisted Moscow’s overtures. With American military backing, the Kurdish militia had taken control of a broad swath of Syria. However, U.S. President Donald Trump’s December decision to withdraw troops from Syria is seen as forcing the Kurdish militia to turn to Damascus. 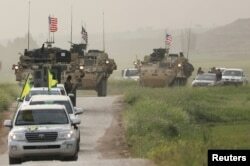 “It’s the main driver, Washington's decision to withdraw its military presence. It pushed the YPG or PYD to direct talks with Damascus,” said former senior Turkish diplomat Aydin Selcen. With as much as one-fifth of Syrian territory under Syrian militia control, Damascus will be accommodating to Syrian Kurdish groups, according to international relations professor Huseyin Bagci of Ankara’s Middle East Technical University. Ankara considers the YPG and PYD terrorist organizations as linked to an insurgency inside Turkey. Turkish President Recep Tayyip Erdogan is threatening to launch a military strike against YPG-controlled Syrian territory bordering Turkey. Turkish forces remain massed along the frontier. Fighters of People's Protection Units, or YPG, gather at their outpost west of the city of Kobani, northern Syria, Tuesday, Dec. 18, 2018. Analysts say a deal between the YPG and Damascus could thwart a military strike. Putin appeared to make a gesture to Erdogan, though, at a joint press conference Wednesday after talks in Moscow. The Russian president claimed a 1998 Syrian-Turkish counterterrorism agreement was still active. The so-called Adana agreement allows Turkish counterterrorism operations in Syria against the Kurdish rebel group PKK, which has been waging a decades-long war against Turkey. Ankara claims the YPG and PYD are affiliated with the PKK. “It's definitely a gesture by Putin. Many people will be surprised he [Putin] mentioned this,” said Selcen. The catch for Ankara is that for the Adana agreement to work, it requires Turkey to restore diplomatic relations with Damascus. Russian President Vladimir Putin and his Turkish counterpart Recep Tayyip Erdogan attend a news conference after their meeting at the Kremlin in Moscow, Russia, Jan. 23, 2019. “Putin is playing chess with Turkey, trying to get Ankara to start talking with Assad,” said Bagci. Moscow is working to end Damascus’ diplomatic isolation. Erdogan severed ties with Syria at the start of the Syrian civil war and vowed diplomatic relations would not be restored while Assad remained in power. With Putin resurrecting the Adana agreement, however, that could facilitate a softening in Ankara’s stance. Erdogan has heavily played the anti-Assad card in domestic politics to whip up his conservative Islamic base, which strongly backs the Syrian rebel opposition. Complicating matters for Erdogan: In March there are key local elections across Turkey. In addition, restoring relations with Damascus could put Ankara on a collision course with Washington, which continues to lobby for Syria’s isolation. “To restart negotiations with Damascus is a difficult political step [for Turkey],” said Selcen. “But the clock is ticking for Turkey, because the UAE, Saudi Arabia, are going back to Damascus, along with the Arab League, so that Turkey could find itself out of step. But Mr. Erdogan is a popular leader. Perhaps Erdogan might wait and see how his party does in March’s local elections, and perhaps we could see a thaw in relations with Syria."